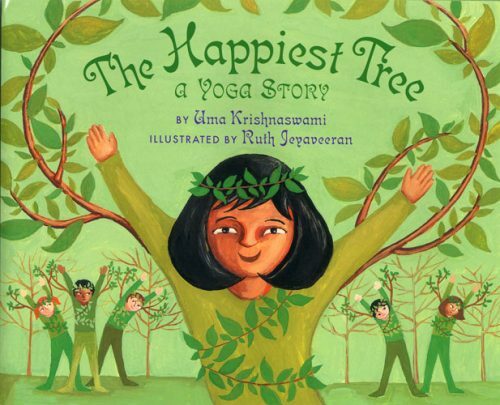 The Happiest Tree: A Yoga Story, written by Uma Krishnaswami, is an empowering story of a young girl’s road to self-confidence. In addition to introducing the practice of yoga to young children, this story’s protagonist, Meena, offers comfort to all children as they struggle to overcome the everyday obstacles of growing up. The word yoga derives from a Sanskrit word “yuj,” meaning “to unite or integrate.” The Happiest Tree: A Yoga Story wholeheartedly embodies Sanskrit’s yuj, as it can be used in the classroom to integrate many discipline areas. Review the teaching tips below for just a few ideas. Connect to Culture: The story includes a number of italicized words in Hindi. Draw attention to the pronunciation guide for these words, which can be found on the second page of the book. The Happiest Treemight be a good title to use in May as part of your observance of Asian American Heritage Month. Connect to English Language Learners (ELL/ ESL): Use the illustrations to enhance understanding of the text. Read aloud and comment on how an illustration provides clues to the words in a story. Connect to the Arts: This book also involves a school play. Meena’s class is writing a “new and improved version” of Red Riding Hood. Invite your students to undertake a similar project with a traditional tale and design accompanying posters to advertise it. Connect to Social Studies: Meena’s family is of Indian descent, and yoga also has roots in India. Use these connections to teach a mini-lesson on the geography of the country. Connect to Physical Education: Model how to use the illustrations to enhance understanding of the text. Read aloud and comment on how an illustration provides clues to the words. There are tens of thousands of known threatened species. It’s critical to teach our children about endangered species because if we don’t know about the problem, we can’t take steps to find solutions.